How does the sensing head work? During testing the sensing head ensures that the running sector of the wire rope is brought to a condition close to magnetic saturation and provides signals from its sensors to the Meraster MD120 tester. Sensors in the head detect magnetic leakage flux due to external or internal defects in the rope, these defects can be as small as 0.05 % of the rope's cross-sectional area. Heads are intended to detect localised losses, eg from broken wires and pitting corrosion; to detect distributed loss of metallic cross-sectional area, due to corrosion, wear and abrasion; and to estimate the depth of the localised loss position inside the rope. Test results are not affected by plastic coating, grease, etc. Two-piece construction makes it possible to test the rope with only one half of the head, for example testing track rope on the ropeway support This two piece construction also makes it easier to carry the head (i.e. in two parts). Detecting capabilities of sensing heads vary between applied sensors. One-channel inductive system, a single coil system used in small heads to correctly detect localised losses. Two-channel mixed system, a single coil system and Hall-effect sensing system used in medium heads to detect localised losses and the distributed loss of metallic cross-sectional area. 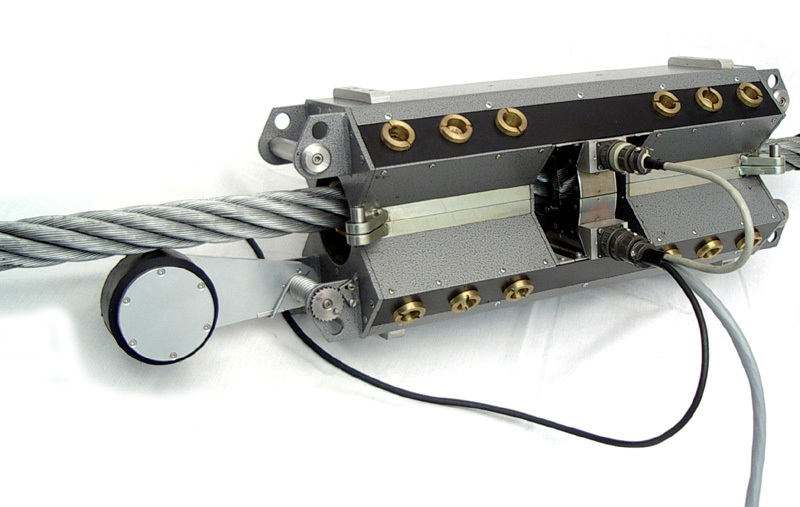 Two-channel inductive system (CI-..), a double coil system used in large heads to correctly detect localised losses and to estimate the depth of the position of the localised loss inside the rope. Full three-channel system (CIH-..), a double coil system and Hall-effect sensing system used in large heads to detect localised losses; to estimate the depth of the position of localised losses inside rope and to detect the distributed loss of metallic cross-sectional area. Supply: Not required for inductive coil sensors. Controlled supply required for Hall-effect sensors. In order to measure the running rope length (and speed of relative movement), heads may be equipped with a special transducer to indicate rope/head movement as an electric signal. 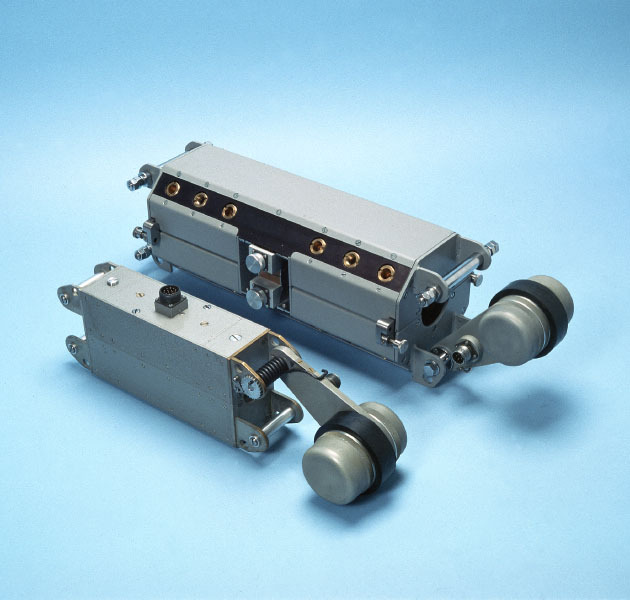 Meraster recorders-defectographs also use it to synchronise the strip chart feed with the rope/head travel and to compensate for speed influence on the inductive coil signal.